Fun Pool Noodle Crafts I Found On Pinterest!!! The weather is warm and I love summer crafting! People have been getting super creative with pool noodles. Here are some fun projects I found on Pinterest and thought you might enjoy!!! 1. Check out this amazing architectural piece that seriously looks like a stone column! 2. Use a pool noodle to make a lamp made out of an old log that also includes resin!!! 3. Use a pool noodle to make a wreath that can be changed to fit for all four seasons! 4. Try this pool noodle flower float! 5. Create a floating cooler for the pool! So convenient! 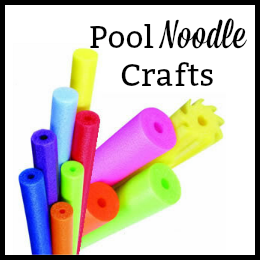 Now run out to the dollar store and pick up some pool noodles, so you can get crafting!! !